Superintendent David Taylor, and his wife Michelle, were giving evidence at the Disclosures Tribunal today. ON DAY THREE of his testimony at the Disclosures Tribunal, Superintendent David Taylor has said that it was “unprecedented” that he would be investigated by the husband of the garda commissioner over an alleged criminal act. However, Taylor denied claims from others that he referred to O’Sullivan as a “liar” and a “most unaccountable commissioner”. The former head of the garda press office is giving evidence over his allegations that he was ordered to conduct a smear campaign against Maurice McCabe from mid-2013 to March 2014 by former commissioner Martin Callinan. Taylor also alleges that Nóirín O’Sullivan was fully aware of the campaign. Today, Mr Justice Peter Charleton accused Taylor of failing to answer his questions, in a testy morning at Dublin Castle. Taylor has been unable to provide details of specific instances where he briefed journalists negatively about McCabe. He has claimed that he would tell the journalists that McCabe was whistleblowing about the gardaí because he was “motivated by revenge” over a sexual abuse allegation that was made against him in 2006. McCabe was exonerated of any wrongdoing at the time. Again today, Taylor was asked about when and where he gave specific journalists this narrative, but was unable to provide details. He was also asked to give details of how the journalists reacted and if they asked follow-up questions to what he was telling them. Mr Justice Charleton put it to him that “journalists ask questions” and the “question that might drip off their tongue is ‘what’s in this David?’”. The former press officer has maintained that he dropped the smear campaign after the resignation of Martin Callinan in March 2014. He was also pressed on this today. It was put to him that, as the McCabe controversy had contributed to Callinan’s downfall, it would have made sense to continue the smear campaign then. Taylor said that he had very little contact with Nóirín O’Sullivan – who would have been acting commissioner at the time – until his removal from the press office. On a number of occasions today, Taylor hinted at having a poor view of Nóirín O’Sullivan without explicitly saying so. She wouldn’t have been my number one choice to be garda commissioner… but that’s just me. He was also critical of the appointment of O’Sullivan’s husband Chief Superintendent Jim McGowan to be part of the criminal investigation into the alleged leaking of information by Taylor of information relating to the Roma children case. In the afternoon, the notes that Mick Wallace TD took of a meeting with the former press officer were put to him. One of those notes referred to Nóirín O’Sullivan as the “most unaccountable commissioner”. Taylor denied ever saying that. It was also put to Taylor that he was “fixated on” O’Sullivan and her husband’s role. It was put to him that he was “lashing out” with his protected disclosure and subsequent allegations as a result. Taylor has consistently maintained that Nóirín O’Sullivan was aware of the smear campaign against McCabe and given regular updates on it. She denies the claims, and will appear again at the Tribunal to give evidence at the end of the month. On the matter of David Taylor’s phones, and the potential misuse of one of them that had been seized from him by gardaí, Mr Justice Charleton repeatedly asked him if he believed any garda had a hand in tampering with his phones. He then accused Taylor of “not answering his questions”. Taylor has said that – when smearing McCabe up to 2014 – he didn’t feel he was doing anything wrong at the time. Furthermore, he said today he didn’t feel that other people who were aware of the campaign – O’Sullivan and the civilian director of communications with the gardaí Andrew McLindion – believed that what was being done was wrong. However, he came to change his mind and made a protected disclosure in September 2016 alleging he was directed to conduct the smear campaign. He was pressed today a number of times over when he came to change his mind and believe that what he had done was wrong. Taylor was unable to provide a direct moment for when it happened and said it was an “evolution” in his thinking that led him to believe the smear campaign was not proper. Prior to telling Maurice McCabe in a meeting in September 2016, he said the only people he told about the smear campaign were his wife and a priest. He was brought through numerous events that occurred in 2016 – including contacting journalist Mick Clifford, and the launch of a judicial review into the criminal investigation against him – but was unable to provide a date for when he believed he had done wrong. In the afternoon, Dave Taylor’s wife Michelle gave evidence. She had helped to set up the meeting between McCabe and her husband in September 2016, and was present in the room for the entirety of the meeting. She said she had been told about the smear campaign while it was going on, and echoed Dave Taylor’s account of filling in journalists of the “back story” and the idea that McCabe was “acting on revenge”. Michelle said she couldn’t remember a certain date or time when her husband would have done this because he was “always on the phone”. She said that McCabe made contact around the summer of 2016 seeking a meeting with Dave but that he wasn’t keen on it at the time. At this time – suspended from the force for well over a year at this stage – Michelle Taylor said she was “very, very worried” about him and that he wasn’t “in a very good place”. He said ‘Maurice I have to be honest with you, there was a campaign against you and I was part of it’. 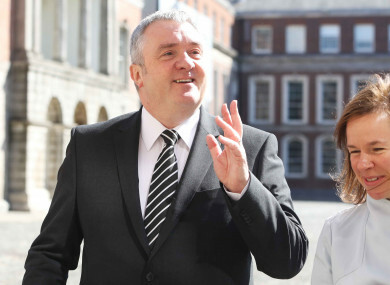 Michelle backed up her husband’s account that Dave only told McCabe that he sent hundreds of texts to Martin Callinan and Nóirín O’Sullivan, rather than texts to journalists. She said that “he’s not much of a texter”, and also denied that he used the word “pusher” in reference to O’Sullivan’s role in the smear. There will be some more questioning of David Taylor tomorrow morning, before the Tribunal hears evidence from Martin Callinan. Email “'Maurice I have to be honest with you - there was a campaign against you and I was part of it'”. Feedback on “'Maurice I have to be honest with you - there was a campaign against you and I was part of it'”.